school this Friday. Photo PrepsKC. If this district pans out on the field the way it looks on paper, this game could really be a one-game playoff to see who makes it into the actual playoffs. Both clubs have had their share of highs (Leavenworth's week five upset of SM West and Lawrence's methodical mid-season turnaround) and their lows (the 2-4 records speak for themselves), but there's something intriguing about both. And who knows, maybe the loser bucks the trend and takes down Wyandotte and Free State and we see both these teams in the playoffs? This game, like the aforementioned one, will go a long ways in determining the playoff fate of SM South. If they win this game, and take care of winless Blue Valley North next week, they will have a good shot at making the playoffs regardless of the outcome of their game against Olathe East. Lose, and the next two games become must-wins. Ra'Keim Abdul didn't play last week in order to get closer to 100% for this contest -- and they'll need every last ounce of effort he can give. Why is Olathe East always good? 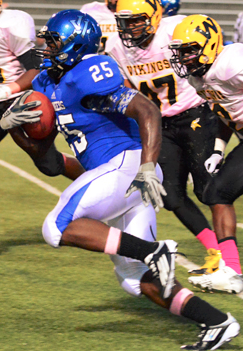 Why do the Hawks consistently enter the playoffs as a state title contender? The key is not in the big games (where, I would suggest Olathe East actually has a history of under performing) but rather in the chippies like this one. Olathe East simply does not lose to lesser skilled teams. And this is what this game is, essentially. The Hawks are more talented and much better equipped for a victory than Blue Valley North. Provided Olathe East doesn't make those statements seem foolish and get upset, the Hawks can secure a 14th consecutive winning season with a victory in this game. The Falcons have had a very good season, especially when you consider the amount of talent they lost from their 2012 team. But this game could be the difference between labeling the season as good and great. Win here, and Olathe South's playoff chances skyrocket. But it all starts with stopping Gardner-Edgerton running back Traevohn Wrench, a combination of size, speed and smoothness we haven't been witness to in the Sunflower League in some time. Wrench, who's rushed for 1,420 yards and 18 touchdowns (at a staggering 9.1 yards per carry) is the centerpiece to Gardner-Edgerton's success. Slow his production, which is a relative term, and Olathe South can win. Let's be honest -- Free State should win this one going away. While Wyandotte does boast Minnesota-bound quarterback Dimonic McKinzy, who's admittedly as athletic as any player in the Sunflower League, one very talented player is not enough to overcome the barrage of talent Free State has. This will be a solid prep game for the Firebirds as their schedule will be more difficult every week from here on out. Olathe North could be playing as well as any team in the league and state at this juncture in the season, but it wouldn't be smart to write off Olathe Northwest just yet. The Ravens played maybe their best game of the season last week in a victory at SM West, and their record could be 4-2 at this point if it weren't for a last second Hail Mary loss to SM East. But the efforts of previous weeks can be tossed out the window in this rivalry, which Olathe North currently leads 7-2 all-time. SM Northwest might have the most deceptively bad overall record in the league. Three of their losses have been by a touchdown or less (once in overtime) and they've competed in every game. They bucked their losing streak against Leavenworth in week five, but a win here would really be huge for the program. 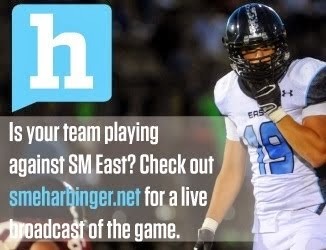 SM East will be giddy to get back on the field following their overtime loss to Free State last Friday. The Lancers look like the favorite in the district, but this game and next week's game against SM West certainly aren't "gimmes." They'll need full focus and attention to detail to ensure they take care of both games. It's been six years since SM West has had a three-game losing streak. To be frank, this has probably been the worst three week stretch (on and off the field) the Vikings have had since Tim Callaghan has been with the program. A big win against SM North would be a step in the right direction. SM West will be the seventh team to face SM North coming off a loss this year, which is an interesting stat to say the least. The Indians showed last week against SM South that they're not just going to roll over and die, especially against a school district foe. My first hope is that the Wyandotte game will be a "get healthy" game for FS after a brutal 4-week stretch. My second hope is to see the offense return. Given the 4 defenses they just faced, I can't help but to think good things are going to happen. I remember McKinszy from last year. Too bad he doesn't play for a SFL school, he's legit. Unfortunately for him, he has no supporting cast to work with. Go 'Birds! Go SMS. Play mistake free and get the win you need.